If you’ve ever made it through a round without having to pull out your sand wedge, hope you counted your blessings, because luck in golf eventually runs out. All golfers end up in the sand sooner or later, whether they hit a bad shot or their ball took a bad bounce. However, it’s the golfers who want to spend as few strokes as possible in the sand who take the time and put in the effort to develop the technique to get themselves out. That means being able to first pick your target and then set up and execute a good swing, and that means developing proper technique. So in this lesson, you’ll learn a number of sand trap tips you can implement next time at the range or on the course to improve your sand wedge technique and escape the bunkers with ease. As PGA Professional Joe Plecker Jr. will explain, the bunker shot is entirely different from the rest of your golf strokes. Your stance is open, the club angle is unique and your swing is aggressive but abbreviated. 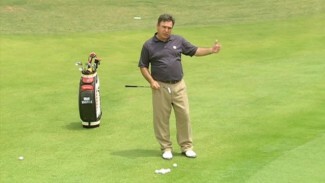 That’s why it’s such an important shot to practice, and why good sand trap tips are so valued. If you know how to settle into the proper stance and put the right swing on the ball, you’re in pretty great shape. 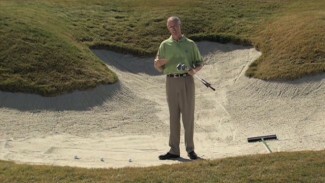 To help you perfect your technique, Joe introduces several sand trap tips for good form, and then demonstrates the step-by-step process of the bunker shot, from initial alignment and lower body setup to the point of impact and the finish. Discover how such minute details as the depth you dig your feet into the sand affects the trajectory of your swing, and why the club face angle for a greenside bunker shot is so different than what you would use for a fairway bunker shot. Learn these and others of Joe’s sand trap tips and you’ll start putting a better swing on the ball and get yourself out of trouble with a lot more success.